As Alessandro said in this thread New official C&C website launched Compass Games has approved the Website and VASSAL Module. I am pleased to say that the Module is nearly ready. I am busy Bug fixing and Polishing right now but the final interface shouldn't change much more. The good news is that it is almost ready for Play Testing and Community input, I will call for volunteers. all the components for a VASSAL tournament are coming into place. I am interested in tournament play! VASSAL Have now approved the page but the Moderators are sitting on the file upload, I have no Idea how long it will take. It took a week to approve the page. If anyone is keen to at least test and proof a pre release copy GM me an email address and, If VASSAL have not approved the File by Sunday, I will email test copies out. however, I couldn't get the Player hands to open, even if I changed position, and also I tried starting a new game from scratch and the hands weren't available then either. Just greyed out no matter what I did. I also noticed that after I uploaded. It slipped through as I have only tested in Solitair mode so far. It was working a few iterations back so I will need to examine the code and see what changed. Edit: Problem located and fixed. Have at it all, let's get them bugs. No there aren't - If any turn up I will gladly add them, for now the Rule Book will have to suffice. Clear is giving me problems so as it stands Clear removes Markers, the Blank Die clears the Dice Tray and the Arrow removes all Move indicators and trails. that helps show that the Leader but not the, possibly, attached unit moved. Personal Preference but in testing both this and the early Napoleonics modules, the Star works better as it can attach without obscuring the underlying counter and ties in with the Scenario Presentation Style, which allows the VASSAL Module to double as a Scenario Creation tool. Mark has listed everything I've found so far. Not being able to access the hands restricts things for actually testing. Definitely need the Orders function. It would be great if the CLEAR button removed the movement trails. I love that you put the dice in the menubar rather than in the dice tray. It is a constant pain in my side to be playing CCN, roll the dice, quickly type a comment, and then yet again remember that I have to first click on the comment bar or the map before I can type a comment in that module. Happily, going to way you have with the dice in the menubar (a bit like CCA), when one rolls the dice one can immediately start typing comments without having to click somewhere special to return the cursor from the tray to the chatline. Not sure how I feel about the leader stars. I think I could get used to it. But I have no problem manipulating leaders in other CC modules. This is great, I can't wait to get playing PBEM! I have uploaded a new version Tricorne.1.0.beta it should overwrite the initial, broken, version and is currently awaiting moderation. Player Selection and Private Hand windows now work. - Fixed Ctrl-O orders unit. - Fixed, Clear Button now Clears all markers, Movement trails and ends turn. (Clear Dice is still a seperate button by design. Fixed, sort of, Leaders may now be ordered and will show ordered state if moved. Scenarios have all been updated to use the new counter definitions, fix minor OOB errors, add Temporary Victory Markers and Label some terrain features. Keep an eye on http://www.vassalengine.org/wiki/Module:Commands_%26_Colors_... - New version will be named Tricorne.1.0.beta.vmod and dated as 2018/01/16 - or drop me a Geek Mail if you would like a copy via email. Beta version is up now. Cntrl-N for units is No Battle. So if you have a leader stacked with a unit that you mark as no battle (e.g. artillery that moved, Light that moved 2), then you also get the Leader label opening. I should be online around 1000 GMT if anyone wants a test game. Ctrl-N for units is No Battle. So if you have a leader stacked with a unit that you mark as no battle (e.g. artillery that moved, Light that moved 2), then you also get the Leader label opening. Good catch, I only envisaged changing the label on scenario creation and forgot about stacked effects. Will revert it to Ctrl-L in next iteration. That was to prevent them being visible when played to the map for the scout option. Take two, peek, choose one discard one. I think in Battle Cry and others it is face down. Will give it some thought and see what others think. has anyone been able to test the module online? I haven't had any luck trying to connect to players online. So I'm managed to play a few games online, and watch one as well. 1. Clear Button- doesn't state End Turn like CCA or CCN. So players like me end up looking for that. Be better if it stated "British Player plays Bayonet Charge"
4. In the scenario setups, the digit of Command and Battle cards is at the front, and therefore appears on the card. Can be solved by shift select and then down arrow, but that also decreases the number. Minor problem indeed. 5. No charts. Be good if a button could include them. 7. Leaders - each player commented they like the block over Star. The precedents of CCA and CCN here. 8. The dice display starts from 5th space, and expands out. So the visual display doesn't match the dice report. If the visual display could run Left to Right that would correspond to the report. Very occasionally this matters if too many dice are rolled, by mis-click or miscalculation. I really like the look of this module so far. When you draw your cards, they go into your hand face down. It would be great if they went into your hand face up. To flip them, you use ctrl-M. In most modules I've used, that's usually the more mnemonic ctrl-F (I don't know if you're using ctrl-F for something else). I agree with Mark that any messages about things moving anywhere "to playtable" don't have much value. But I love the layout and look and so far I'm getting used to the stars for leaders (though I agree that it seems to break with the C+C system in that respect). Wondering if you are intending on finalising the Beta version? Been fiddling around in the module, and by trial and error I've managed to turn off the move reports, and add a message to the Clear Orders Action. Also go the cards to flip as they enter the hands. so I've had a fiddle, and some able assistance from Guilio, and vers 1.2 is now up on VASSAL. - the discard deck is drawing back a random card, not the top card. 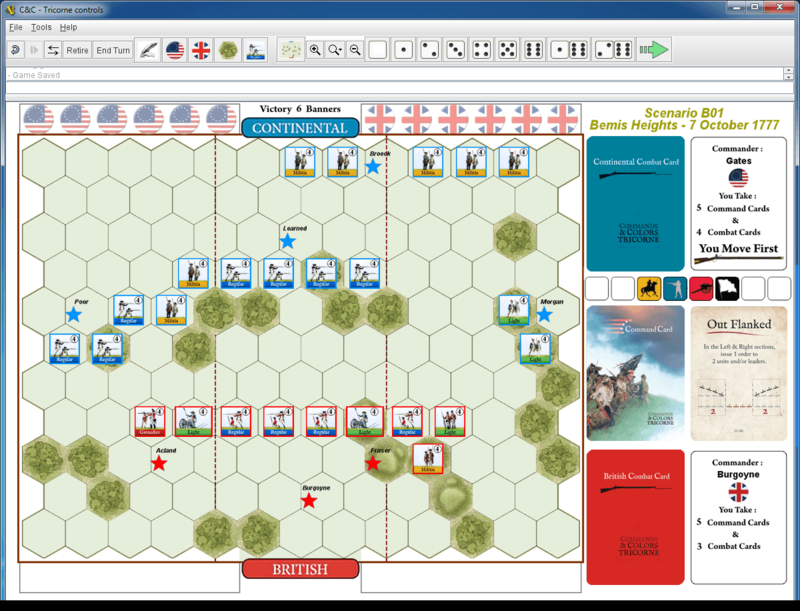 However, it seems to run a bit smoother and more like C&C Napoleonics and Ancients modules.